Photo: Pryor Brock Farmstead, ca. 1878, 8602 County Road 500 South, Eagle Township, Boone County, IN. Listed on the National Register of Historic Places in 2008. Photographed by User:Nyttend (own work), 2011, [cc0-by-1.0 (creativecommons.org/publicdomain/zero/1.0/deed.en], via Wikimedia Commons, accessed March, 2014. Boone County Courthouse is located at 310 Courthouse Square, Lebanon IN 46052; phone: 765-482-0530. Boone County is divided into 12 townships. Each is six miles square and is divided into sections; each section contains 640 acres. The townships are Marion, Clinton, Washington, Sugar Creek, Jefferson, Center, Union, Eagle, Perry, Harrison, Jackson, and Worth. All of the townships were original except Worth which was created in 1851. Boone County is on the ridge (formerly called the dividing swamps) between the White River and the Wabash River. It is the source of Eagle Creek, White Lick, and the Walnut Fork of the Eel River. The soil in the county is black loam, very fertile, and therefore well suited for agricultural uses. However, at one time, it also supported dense forests which had to be cleared. Some areas also were swampy, necessitating drainage for development. The county was organized by the Indiana legislature in 1830. This legislation also provided for five appointed commissioners who, among other duties, were to locate and name a county seat. The location of the county seat was to be within two miles of the center of the county since the original choice, Jamestown, was not convenient for all county inhabitants due to its location in the southwest corner of the county. On May 1, 1831, three of the commissioners met at the geographic center of the newly formed county. The woods and underbrush were dense, the land itself swampy, and there were no settlers—white or Indian—within miles. A little north of this center point, the men noticed a knoll dry enough for a courthouse to be erected upon. One of the commissioners, A.M. French, named the spot Lebanon, likening the tall timbers to those of Lebanon and of the Jordan. The first white settler in Boone County was Patrick Henry Sullivan who purchased 80 acres in what is now Eagle Township in 1823. However, the first permanent settlement in what is now Boone County was not established until 1828 on the present site of the town of Thorntown. In the early days of Boone County, the principal element of commerce was trading of skins and other goods. This barter economy was a legacy of the French trading post at Thorntown. As late as 1819 that trading post had a population of 400 Indians and a few French traders. A primary contributor to the commercial development and expansion of Boone County was the completion of the Indianapolis, Cincinnati & Lafayette Railroad from Lafayette to Indianapolis in 1852. Accompanying this railroad was a telegraph line, and this led to the establishment of the county's first newspaper, The Boone County Pioneer. In addition, the Michigan Road (U.S. 421), running from Indianapolis to Lake Michigan, was authorized by the Indiana legislature in 1828 and ran through the eastern part of Boone County. Required by law to be 100 feet wide, it became one of the most traveled highways in the state. After the county was organized and its attributes became known, settlers arrived from the states to the south and east of Indiana. These included settlers from Virginia, North Carolina, Tennessee, and Kentucky. The population of the county grew from 622 in 1830 (excluding Indians) to approximately 30,000 in 1875. By 1878, the county counted 150 manufacturing establishments including mills, wagon shops, hub and spoke factories, and ditching tile factories. 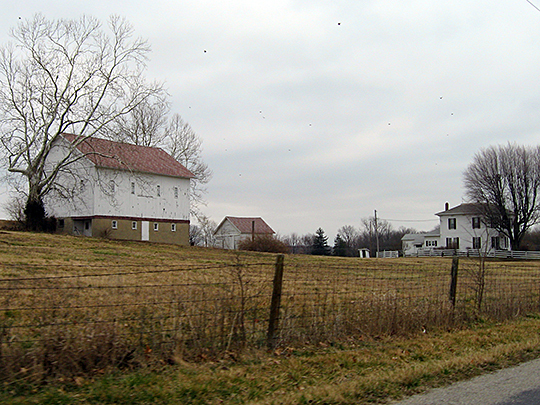 Today Boone County has a population of 36,317 and remains predominantly an agricultural county. The principal population centers are Lebanon, Zionsville, Jamestown, and Thorntown.